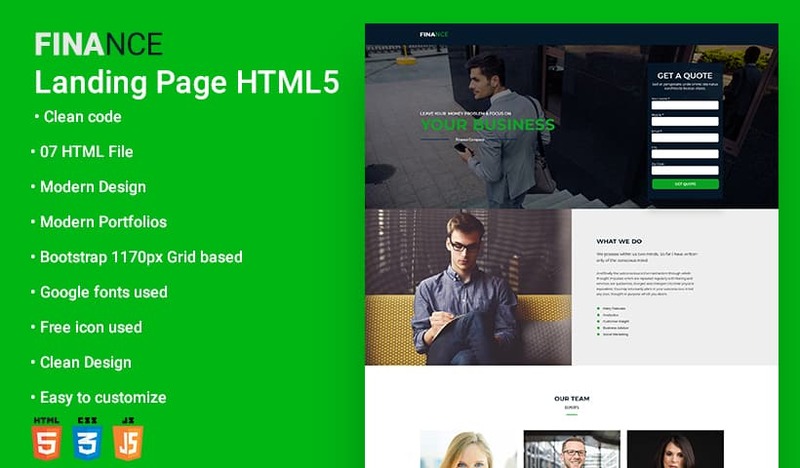 Finance is a Professional HTML-5 Landing Page Template exclusively built for finance related businesses like financial company, accounting, brokerage, coaching, law office, business planning and consulting websites. Finance Template is entirely clean, Modern and advanced HTML5 Landing Page. This template is typically crafted for corporate website like Financial Adviser, Accountant, Consulting Firms, insurance, loan, tax help, Investment firm etc. 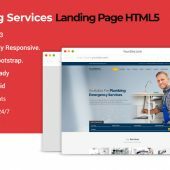 Finance is a business Landing Page Template that is helpful for online presence for Corporate Business and Financial Firms. Finance Landing Page Template includes all necessary features for your online presence like Projects, Video section, testimonial, Our Services and functional contact us form. This template would be a great choice for your online presence. It is super responsive and easily customizable template. Finance Landing Page Template is single page HTML, CSS and bootstrap combo business Template. It is best suited for corporate website like Financial Adviser, Accountant, Consulting Firms, tax etc. The layout is very easy to understand and easy to modify according to your needs. Finance Template is fully responsive and looks attractive at all screen sizes whether it is a desktop, laptop, tablet, or mobile.